Superb & extremely rare, Arts & Crafts bureau bookcase cabinet by Sir Ambrose Heal; part of his " Fine Feathers" suite of furniture, c1898. 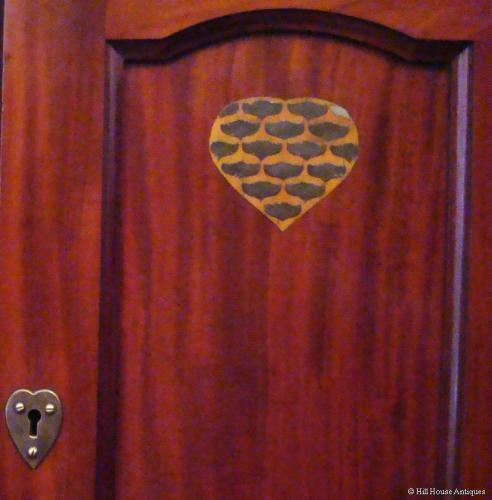 Stylised peacock feather hearts inlay to doors and further pewter and other wood inlay throughout. Complete with it`s internal double pewter inkwells and Voysey style pen tray. Matches the other " Fine Feathers" piece we have. Similar illustrated in the Jeremy Cooper book "Victorian & Edwardian Furniture & Interiors" pl 647. Approx 48" wide and 66" high.